Argentina has been known to be a pretty much a reasonably crypto-friendly country. Apparently, embracing the future is on their list, since the cryptocurrency adoption is growing at a fast pace. In 2018, it already had introduced about 4000 crypto-enabled ATMs with the prospect of opening more in 2019. Moreover, the authorities there seem to be positive about cryptocurrencies, and while cryptocurrency is not a national currency, it can be considered and treated as money. Argentina’s Banco Masventas started using Bitcoin for cross-border transfers instead of SWIFT (short for The Society for Worldwide Interbank Financial Telecommunication). This endeavor is the result of a partnership with local blockchain financial services startup Bitex. Continuing the trend of cryptocurrency adoption and integration as a payment method for products and services is the implementation of digital currencies in Argentina’s public transportation. Transport payments can now be executed with Bitcoin in 37 localities in the South-American country. 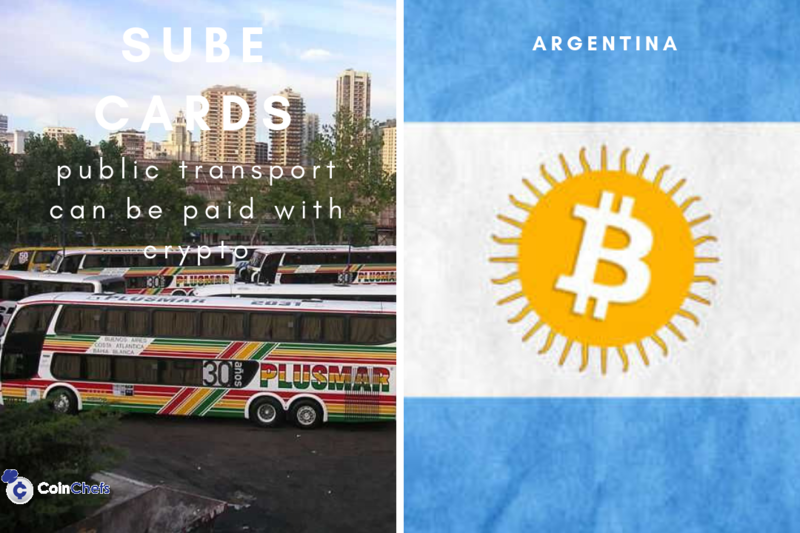 More specifically, the national SUBE [standing for Sistema Único de Boleto Electrónico] cards, which are smart cards used to pay for public transport throughout Argentine can be loaded with BTC. This new service is managed by Alto Viaje, who has signed an agreement with Bitex to allow those transactions. The company Alto Viaje is a dedicated online platform which facilitates users to transfer funds to the SUBE card, while Bitex is one of the largest companies in Argentina which offer blockchain and Bitcoin solutions. The critical objective for Alto Viaje was to extend their portfolio of payment services and make the card-loading process more accessible and smooth. Before the addition of bitcoin payments, the platform only accepted PayPal. Also promoted by the Argentine Secretary of Transportation, The SUBE card is the single one that can be used for public transport payments in Argentina. It is valid for “buses, trains, subways, and motorboats,” as detailed on the government website. These rechargeable travel cards can be purchased at metro stations, tourist assistance centers, national lottery outlets, and corner shops. The minimum charge in bitcoins will be 50 pesos for the SUBE. So, the minimum payment that can be processed with Bitcoin is 0.00039 BTC. Plus, a bus ride in the City of Buenos Aires will only cost a customer about ARS 18 (about 0.48 USD or 0.00014 BTC). In addition to the metropolitan area of the capital city of Buenos Aires, Sube cards can be used in the following cities: Bahía Blanca, Catamarca, Cipolletti, Comodoro Rivadavia, Corrientes, Formosa, General Pico, General Pueyrredón, Gualeguaychú, Jujuy, Necochea, Neuquén, Olavarría, Palpalá, Paraná, Partido de la Costa, Pergamino, Pinamar, Rafaela, Rawson, Resistencia, Río Gallegos, Río Grande, Roque Sáenz Peña, San Carlos de Bariloche, San Juan, San Luis, San Martín de los Andes, San Nicolás de los Arroyos, Santa Fe de la Vera Cruz, Santa Rosa, Trelew, Ushuaia, Venado Tuerto, Viedma and Villa Allende.